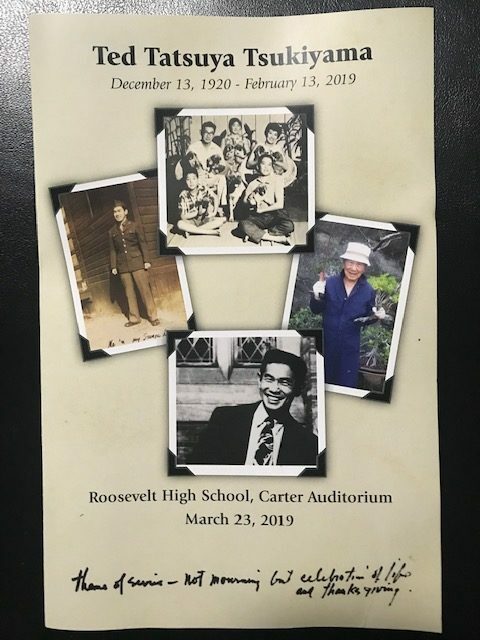 Friends, family and the community celebrated the life of Mr. Ted Tsukiyama on March 23, 2019. He was born in Honolulu on December 13, 1920, then went with his mother and sister to his mother’s home of Kagawa, Japan at the age of 4 or 5, returning to Kaimuki about a year later. He graduated from Roosevelt High School, then went to the University of Hawaii. At UH, he was an ROTC cadet until just after the Pearl Harbor attack, at which time Japanese-Americans were dismissed. He joined the Varsity Victory Volunteers, then the 442nd Regimental Combat Team when it was formed. He later transferred into the Military Intelligence Service, where he served as an interpreter in Burma. After the war, he was the first Japanese-American to attend Yale Law School, and became an attorney in Honolulu. He played an important role in preserving the history of the 442nd RCT and recorded his memoirs in his book “My Life’s Journey: A Memoir.” He and his wife Fuku had 3 children – Sandy, Paul and Tim. 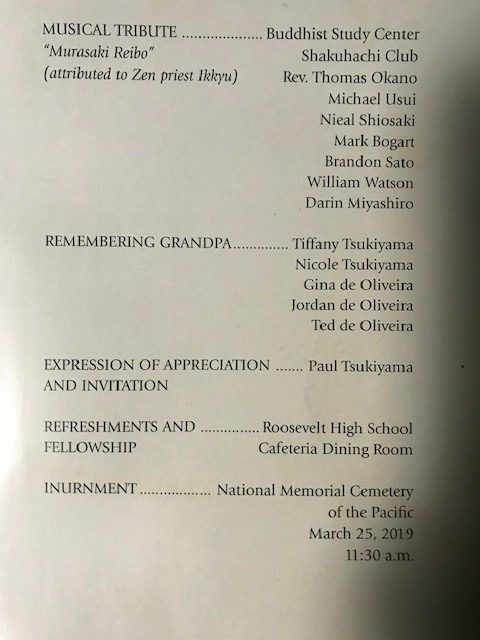 He was laid to rest at Punchbowl National Memorial Cemetery on March 25, 2019. Videos of the celebration of life and inurnment are available on YouTube. 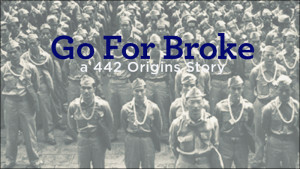 “442nd RCT Foundation Presents a Stacey Hayashi Production” was on the printed program for this special event to provide a preview of this movie long in the making on the 442nd RCT. 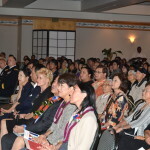 In attendance at the Hawai’I Theatre in Honolulu were some 442nd veterans, many 100th/442nd family members and distinguished guests. The movie preview was attended by approximately 1400 people. 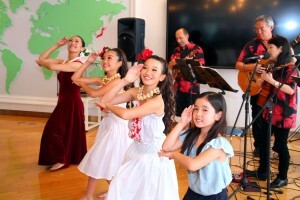 Opening the event was a group of dancers from Okinawa and Hawaii, with a lively presentation. Then Jake Shimabukuro played the national anthem on the ukulele and the 100th/442nd Reserves Guard posted the colors. Admiral Harry Harris, Commander U.S. Pacific Command, gave the keynote speech and then made a special presentation of the French Legion of Honor medal to veteran Mr. Masayoshi Nakamura. The text of Admiral Harris’s speech can be read here. Hawaii Governor David Ige then presented Stacey Hayashi with a proclamation making October 8, 2017 “Go For Broke” day. This movie was dedicated to the late K. Mark Takai, U.S Representative from Hawai’I and a strong supporter of Stacey Hayashi and this movie. His daughter says “Go For Broke” in the movie. Stacey said Mark would leave copies of her book “Journey of Heroes” in his office for people visiting to read. 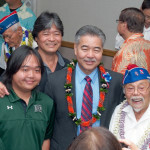 Former Senator Daniel Akaka attended and was in one of the scenes of the movie (look for him in the funeral scene.) 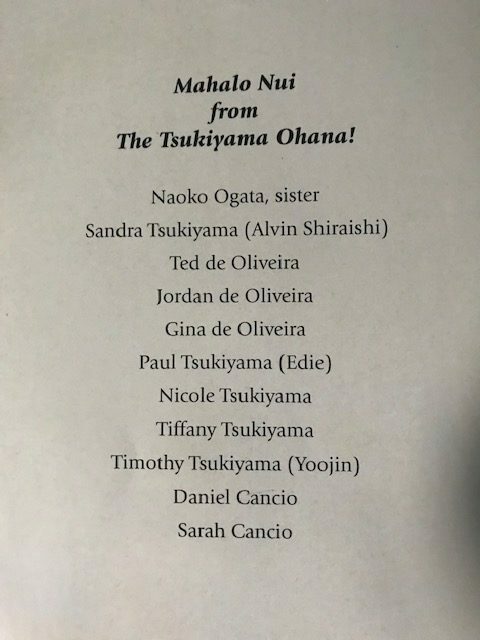 Our own S&D member Anita Nihei was an extra and you can see and hear her a couple of times during the scene at Iolani Palace. S&D member Gwen Fujie and Anita’s son Gavin were also extras but the camera goes pretty fast at times and the crowd and recruits are big groups. The movie itself moves quickly (90 minutes) and covers events just before and the year after Pearl Harbor. It tells of the Hawaii Territorial Guard and the formation of the Varsity Victory Volunteers (VVV). It also introduces the 298th Infantry/100th Infantry Battalion. The movie closes with the famous picture taken at Iolani Palace of the men who were inducted into the 442nd RCT in April 1943. 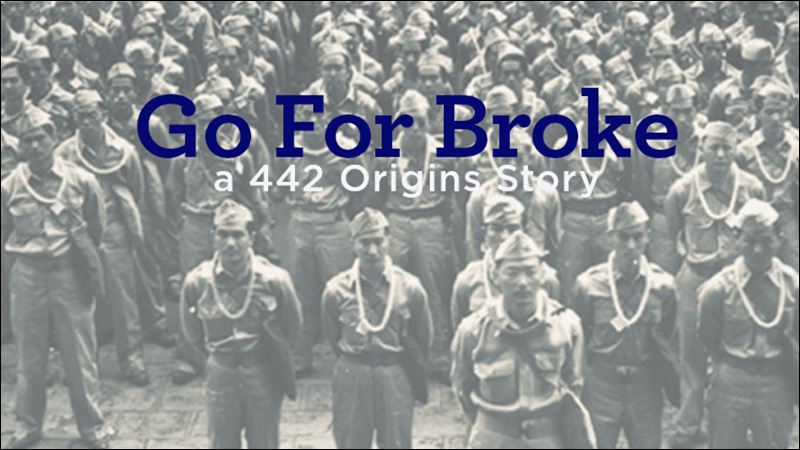 Very touching as we get a look into the daily lives of different people before, during and after the start of the war, scnes which are based on stories from 442nd veterans. The U.S. Army plans to open a new National Museum of the U.S. Army (NMUSA) near Washington D.C. in 2019. 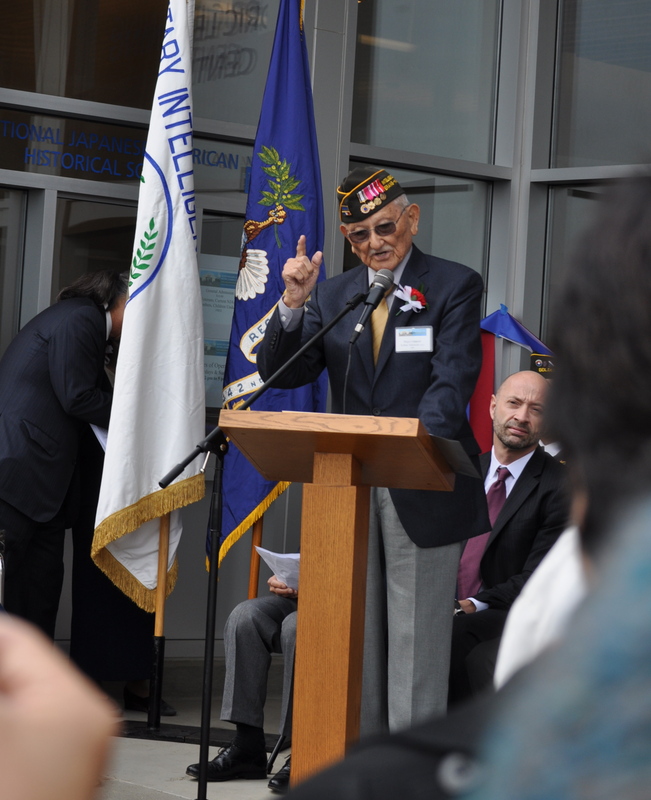 NMUSA will include sections recognizing the WWII Nisei Soldiers of the 442nd RCT, 100th Infantry Battalion and Military Intelligence Service. It is seeking individual Nisei Soldier stories, as well as objects and artifacts that will be made part of the exhibit. See the NMUSA website at: thenmusa.org. The Sons & Daughters Chapter is working with the National Veterans Network to coordinate the submission of 442nd Soldier stories for consideration for use in the museum. S&D member Lynn Heirakuji is the point of contact for this project and is providing detailed information on how interested parties can submit Soldier stories, as well as donated objects and artifacts, to be considered for inclusion in the NMUSA. Attached is an Information Sheet (below) on NMUSA along with two Attachments that explains NMUSA and what it is seeking to help create the Nisei Soldier sections of the new museum. The one-year deadline for bringing these sections to completion is very tight. This is an extremely important and rare opportunity for the compelling story of the WWII Nisei Soldiers to be told at the national level and to a broad audience. that you would like to permanently donate to NMUSA, please consider doing so – submission deadline is September 30, 2017. On behalf of the Sons & Daughters of the 442nd RCT, Lynn is coordinating the submission of 442nd RCT Hawaii Nisei Soldier stories. Mark Matsunaga and Susan Muroshige will be coordinating the nominations for the MIS and 100th Infantry Battalion Soldiers, respectively. Please email Lynn at LHeirakuji@gmail.com if you have any questions or need help with your nomination submission. Or you can call or text Lynn at 240 351-8656. The Hawaii Nikkei Legacy Exhibit at the Japanese Overseas Migration Museum, Yokohama, Japan. Photo courtesy of Philbert Ono. 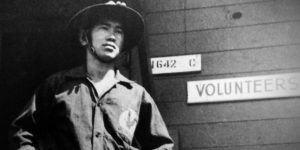 An exhibit highlighting the Japanese-American experience in Hawaii from the initial waves of immigration through World War II and the post-war period with photographs and narrative text in English and Japanese opened in Yokohama this past June. Included are photos of Nisei soldiers from the 100th, 442nd, 1399th and MIS who fought in World War II to prove their loyalty to the United States. The exhibit also includes a section on prefectural roots that identifies prominent Japanese Americans from Hawaii whose ancestors were part of the flow of contract workers (kanyaku imin) who came to Hawaii beginning in 1885 to work on the sugar plantations. The idea for this exhibit was initially conceived in 2015 by Mrs. Michiko Shigeeda, wife of the then Consul General of Japan in Honolulu, Mr. Toyoei Shigeeda, who is currently Japan’s ambassador to Lithuania. Mrs. Shigeeda felt that the Japanese people who already have a strong affinity for Hawaii would be interested in learning about the history of the Japanese Americans in Hawaii. 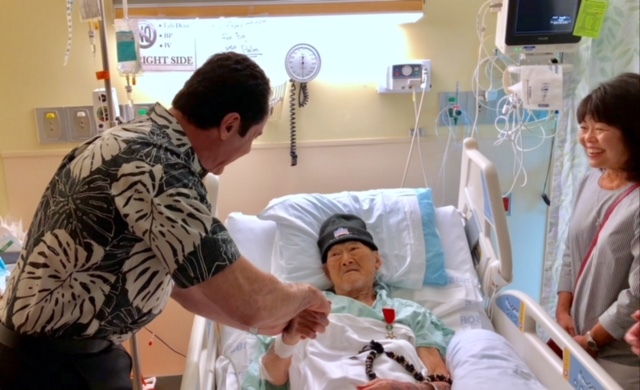 Bishop Ryokan Ara of the Tendai Educational Foundation, who was recently named a Living Treasure of Hawaii by the Honpa Hongwanji Mission of Hawaii, was the spiritual inspiration for the project. 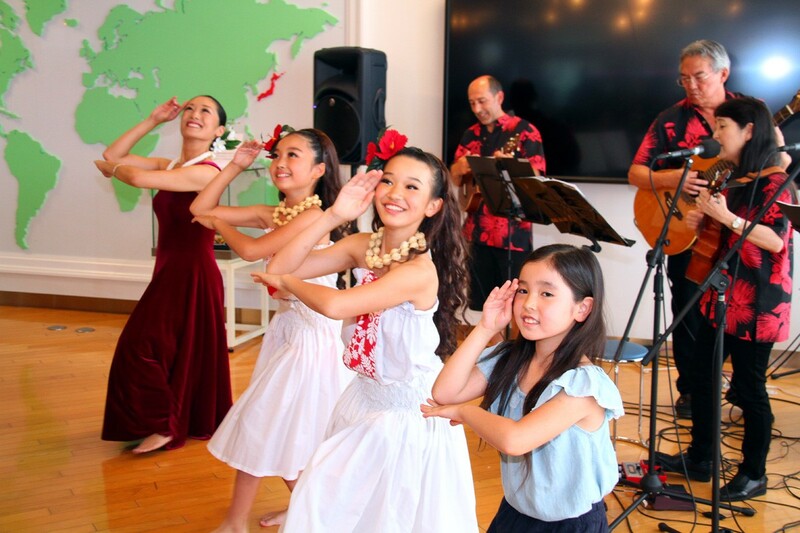 Bishop Ara has worked for over 40 years to improve the understanding and relationships between the Japanese Americans in Hawaii and the Japanese people. Mr. Ryoji Koike of the Pacific Aviation Museum played a key role in coordinating with organizations and support groups in Japan. An exhibit content committee, including three S&D members, collected photographs, wrote the narrative and designed the exhibit. 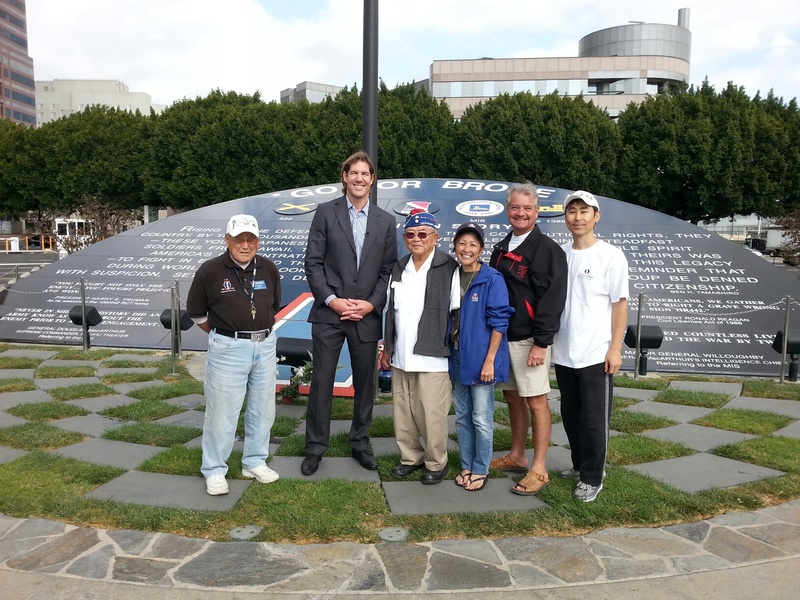 The project was prepared completely through volunteer efforts with printing and other expenses funded by the Nisei Veterans Legacy (NVL) and in-kind contributions. Titled, “The Hawaii Nikkei Legacy,” the exhibit is co-sponsored by the NVL, the Japan America Society of Hawaii and the Japanese Cultural Center of Hawaii. (“Nikkei” refers to Japanese who have migrated to various foreign countries.) 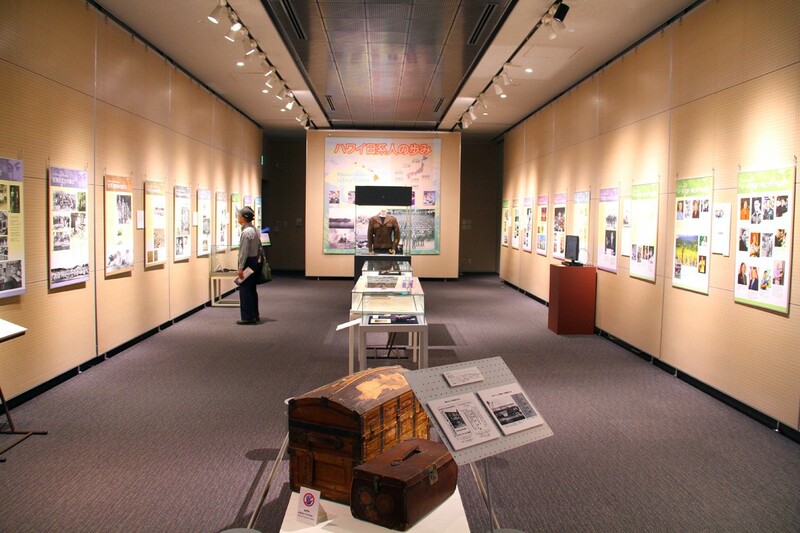 The exhibit is currently open at the Japanese Overseas Migration Museum (JOMM) in Yokohama, Japan. The JOMM is operated by the Japan International Cooperation Agency or JICA. The JICA is the rough equivalent of the USAID in the United States and one of its elements is the Association of Nikkei and Japanese Abroad, which serves as the host for the exhibit. The exhibit is scheduled to be shown at the JOMM through September 3, 2017. It will also appear at the Hawaii Expo event at the Hikarie Building in Shibuya, Tokyo from July 15-17. Then it will be shown in Fukushima City from July 19-29 in conjunction with the City’s 110th anniversary celebration. Finally, it will be at the Imperial Bank Building in Hiroshima City from October 1-14. Anyone traveling to Japan during these time periods are encouraged to see the exhibit. The exhibit may also be shown in Hawaii in 2018 though no arrangements have been made to date. Hawaiian music performance by Kuʽulei Mamo Park (daughter of a 100th Infantry Battalion veteran, at right in photo – corrected) and her band with hula dancers at the opening ceremony for the exhibit. The S&D has initiated a volunteer project with Hamilton Library at the University of Hawai’I at Manoa to digitize archival material that was previously given to the Library by the 442nd Veterans Club. Much of the material is only accessible currently by visiting the Manuscripts and Archives Department in person. S&D members have volunteered to digitize the material, which will allow Hamilton Library to provide the information online to provide access to many more who may be interested in the 442nd RCT. The volunteers are to receive training beginning in late July and the hope is to start the project in August with the goal of completing much or all of the digitization by some time next year. The material that will be digitized includes copies of National Archives documents related to the activities of the 442nd RCT, 100th Infantry Battalion, MIS, 1399th Engineers and other Japanese Americans serving in World War II; and a set of material collected by the 442nd Veterans Club such as a copies of the memoirs of Chaplain Masao Yamada (3rd Battalion) and of the memoirs of members of Love Company. Hamilton Library has these materials in the Japanese American Veterans Collection. By digitizing the material, the goal of the S&D and Hamilton Library is to increase access to these important resources. At this time (July 2017) we have had good response from our S&D members and are not actively recruiting volunteers. The next time you visit Maui, please take a few minutes to visit the Education Center at the Maui Nisei Veterans Memorial Center. It is at One Go For Broke Road, which is accessed from Kahului Beach Road as you head from Kahului towards Wailuku along Kahului harbor. Look for the building complex on the hill on the left side. The Education Center is the first building on the left as you approach the complex. Visitor parking is available just in front of the building. Admission is free. 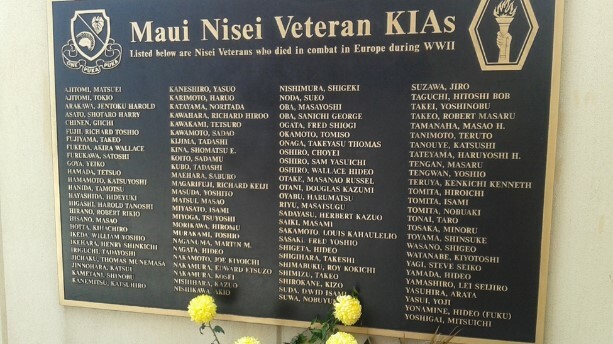 Before you enter the building, you can peruse the Wall of Honor which lists the names of all Maui Nisei soldiers that lost their lives in combat in Europe during World War II. If you know someone on the Wall of Honor, the Education Center may have information on the Veteran. The Center also has stories about the Nisei Veterans who returned to Hawaii and their lives after the war. The Center shows exhibits from time to time to help educate the general public about the Nisei soldiers. The Military Intelligence Service exhibit that on display at the U.S. Army Museum at Fort DeRussy (Oahu) just completed a showing at the Center. The Center also shows a short video that features the Nisei soldiers from Maui. Before you go to the NVMC, check out their website: http://www.nvmc.org/. 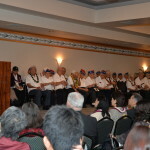 The mission of the Maui NMVC is to ignite human potential by inspiring people to find the hero in themselves through the legacy of the Nisei Veterans. Inspiring stuff. The Friends and Family of Nisei Veterans (FFNV) mission is to preserve the proud accomplishments of the 100th/442nd Regimental Combat Team (RCT) and to honor all veterans of the RCT. The FFNV activities include presentations by guest speakers on topics related to the RCT, Nisei veterans, and World War II; an annual membership meeting; periodic community events in the Alameda/Northern California area; etc. Their website can be found at ffnv.org and contact information is on the Contact Us link of the site for those wishing to learn more about the FFNV. HONOLULU, HAWAII (September 6, 2016) – As a result of meetings and discussions between Plaintiffs’ counsel, Jeffrey S. Portnoy and John P. Duchemin, and Defendants’ counsel, Deputy Attorneys General, Andrew L. Salenger, Dana A. Barbata and Caron M. Inagaki, Plaintiffs Noboru Kawamoto and Elaine Kawamoto have been reunited in his nursing care home pending determination by the Court of the constitutionality of certain Hawaii state statutes and administrative rules applicable to community care foster family homes. Plaintiff Noboru Kawamoto is 95, a World War II veteran and member of the 442nd Regimental Combat Team, and his wife, Plaintiff Elaine Kawamoto, is 89. This temporary accommodation is limited to these Plaintiffs and the impact of the laws as applied to them only. Counsel expect to file motions seeking summary adjudication of this lawsuit by United States District Court Judge Leslie E. Kobayashi to resolve this case. Please note that there will be no further comment to the press at this time. Thank you. France honors veterans of the 100th Infantry Battalion and 442nd RCT in three separate ceremonies held on the Big Island, Maui and Oahu. 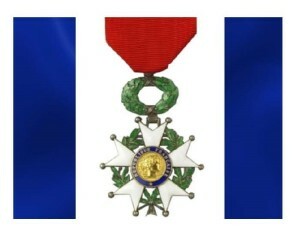 Some 57 veterans received the French Legion of Honor decree, the highest decoration bestowed by France, in recognition of those who risked their lives during World War II to liberate France. Los Angeles – November 10, 2013. 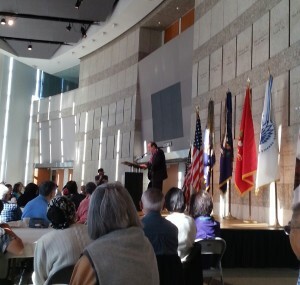 The Japanese American Museum in Los Angeles celebrated to opening of a new exhibit entitled, “Go For Broke: Japanese American Soldiers Fighting on Two Fronts.” The exhibit is part of an extensive collection held by writer and military historian, Eric Saul. I think we all felt that we had an obligation to do the best we could and make a good record. So that when we came back we can come back with our heads high and say, ‘Look, we did as much as anybody else for this country and we proved our loyalty; and now we would like to take our place in the community just like anybody else and not as a segregated group of people.’ And I think it worked. Hawaii is our home; the United States our country… We know but one loyalty and that is to the Stars and Stripes. We are gathered here today to talk about a group of men. Men who fought for their country and for their community. They were fighting two wars: a war against prejudice and racism at home and a war to literally save the world from tyranny. It has now been more than 70 years since the first Nisei committed themselves to the fight for democracy. 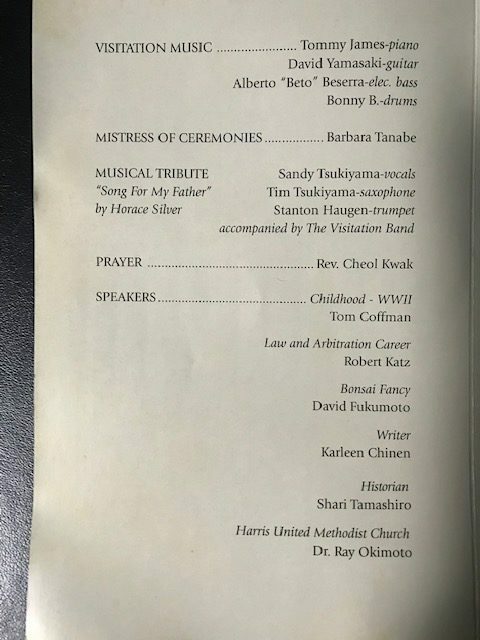 Many of these Nisei have passed from this world and are no longer here with us to tell us their story. Some of you Nisei are in the audience today, and I will be addressing my remarks today to you. Who were you? First of all, you were Americans. You happened to be of Japanese Ancestry. You were called Nisei. You were second generation, born in the United States. Most were born in the 1920s. Where were you from? You were from Hawaii, Ohau, Maui, Kawai. You were also from California, Oregon and Washington. You grew up on Honolulu, Los Angeles, Boyle Heights, the Paloma District, Fresno, Seattle, Portland and in hundreds of small farming towns in the Western United States. You lived in the Little Tokyos and Nihonmachis of the big cities on the West Coast. In Hawaii, you grew up on plantations, where you toiled in the hot sun, helping to harvest and process the sugar cane. San Francisco- November 11, 2013. The MIS Historic Learning Center held its opening day ceremonies after 25 years in the making. It began operations as the first MIS language school in 1941, a month before the bombing of Pearl Harbor. Many dignitaries, veterans, and family members attended the ceremony. I was a member of the Military Intelligence Service during World War II. This building has a connection to all of us who served in the MIS. We began our long journey from here to prove we’re Americans. But first, let me remind you of our shameful and ugly history so that you can fully understand why so much blood was spilled by my generation. Our lives changed dramatically on December 7, 1941. We nisei were suspected of being disloyal and were classified as “enemy aliens” (4-C). With one stroke of a pen, 70,000 nisei lost their citizenship. One hundred and twelve thousand Japanese residents from the West Coast were sent to internment camps. From April 1942 to October 1943, 17,000 so-called “enemy aliens” lived in the stables at Santa Ana racetrack under deplorable condition. In 1943, we were allowed to enlist in the Army. Even while in the Army, we were called Japs. When we returned home from the battlefields with Purple Hearts, we were met with signs that read, “No Japs allowed”. We were refused service at barber shops, restaurants and other places. We looked like the enemy, but we were Americans at heart. What price is freedom, we wondered? Most internees accepted their confinement, surrendered and said, “Shikata ga nai,” meaning “it can’t be helped, there is nothing we can do”. Oh yes, we did. More than 33,000 of us served in the military during World War II.. That was more than 13 percent of the total Japanese population in the U.S. and greater than the national average. We suffered racial adversity since that December day. We had to gaman and ganbare. These two values were our guiding principle that navigated us through a sea of racial prejudice, hatred and distrust.